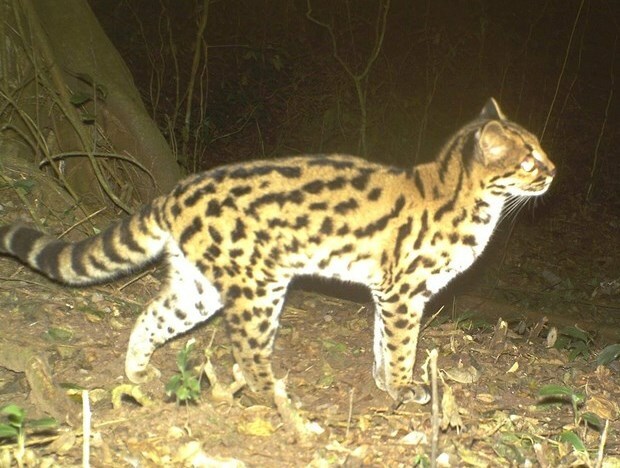 A mid-sized cat with beige fur, black and gold rosettes and dark stripes down the back, at first glance the Margay could be confused with the ocelot. However, the Margay has several unique features to suit its nocturnal lifestyle spent prowling the forest canopy, including bulging brown eyes, broad paws and long tail. Margays are extremely agile, with adaptations which allow it to manoeuvre easily between branches, including hind feet which can rotate 180 degrees, making the Margay is the only cat able to descend a vertical tree head first. The tail can measure up to 70% of the head and body length and acts as a counterweight to help maintain balance. Their large paws aid their jumping and allow them to grip tree bark and narrow walkways. Captive Margays have been reported to run along clothes lines, jump 4 metres horizontally and 2.5 metres vertically and hang by their hind feet to manipulate objects with their front paws. The agility of Margays enables them to prey on small mammals that would otherwise be hard to catch in their arboreal habitat, such as small primates and squirrels. However, they also prey on amphibians, reptiles, birds and eggs. It also comes in useful whilst navigating the tree canopy, and they can catch themselves whilst falling with quick movements to grab branches before climbing back up. They are also intelligent and opportunistic predators. Researchers in Brazil found Margays feeding on bats caught in mist nets and there are also reports from field researchers and Amazonian inhabitants of Margays attracting pied tamarin prey by mimicking the calls of tamarin pups. The adaptations of the Margay to their forest habitat is such that they are badly affected by their contracting ranges due to deforestation and land conversion as they refuse to cross open areas with no cover. Margays are found almost exclusively in forest habitats which vary from humid tropical evergreen and deciduous forests to montane and cloud forests, continuous stretches of woodland to small swamp fragments surrounded by savanna, and even coffee and cocoa plantations when there is sufficient tree cover, though they are less tolerant of human settlement than other cats. There are very few recorded instances of Margay activity during the day when they can be found resting in trees seven to ten metres above the ground (possibly as protection from ocelots). The Margay’s excellent adaptations for an arboreal lifestyle make it dangerously dependent on continuous forest habitat. Populations are declining as their forest ranges are reduced by human conversion to agriculture, pasture and infrastructure development. Unfortunately Margay end up cornered in isolated parcels of land surrounded by cleared forest where the population suffers from inbreeding and lack of prey. In Brazil, due to habitat fragmentation, populations in the Atlantic Forest are more threatened than those in the Amazon. Due to its beautiful thick, soft fur, Margay was one of the most heavily exploited cats for the fur trade until trade restrictions in the late 1980s. As Margays are smaller than other sought-after cats with similar coats (ocelot, jaguar, leopard) it took at least fifteen animals to make one coat. In 1977 at least 30,000 skins crossed the international market, which declined to 138 in 1985 following legal protection of some of its range and CITES fur trade regulation6. However, illegal hunting is still a threat in some areas for trade in the pet and fur industries and retaliatory killing when animals are found attacking poultry. The Margay also suffers under the ‘ocelot effect’: they tend to be rare in areas where their range overlaps with ocelot. Alike not only in appearance, there are also significant similarities in their diet and ocelot will kill Margay to eliminate competition. Rocha-Mendes, F., & Bianconi, G. V. (2009). 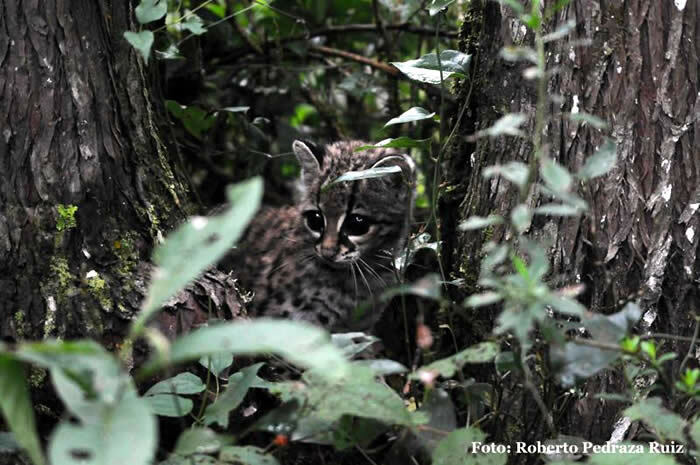 Opportunistic predatory behavior of Margay, Leopardus wiedii (Schinz, 1821), in Brazil. mammalia,73(2), 151-152.
de Oliveira Calleia, F., Rohe, F., & Gordo, M. (2009). Hunting strategy of the Margay (Leopardus wiedii) to attract the wild pied tamarin (Saguinus bicolor).Neotropical Primates, 16(1), 32-34. Margay history in the fur trade: Nowak, R. M. (1999). Walker’s mammals of the world (Vol. 1). JHU Press.